Born Yesterday Records has turned out some impressive releases in it’s short existence thus far. 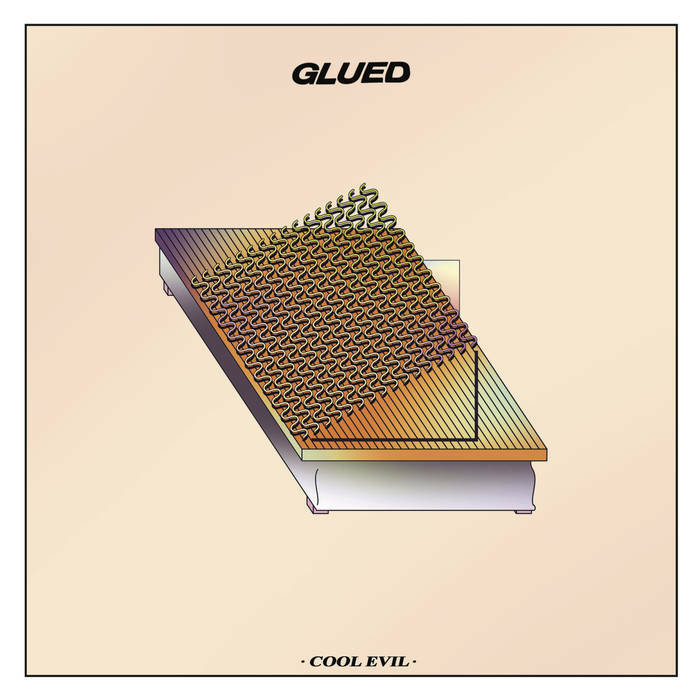 St Louis’ Glued recently joined their budding roster with Cool Evil. It’s a record whose vibe is summed up well by its title. The album’s nonchalant edge is introduced at the first moment. Angular guitars and forward drums kick off the record on “Used To It,” complemented by sneering vocals. The song builds into a ferocious sing-along of the track’s title. It’s fresh and immediately interesting. Many times in the record, the band follows itself down a rabbit hole to let a song breathe, evolving and propelling towards finality and back with cool-headed guitar/bass melodies and head-bobbing grooves. This is illustrated well on “Beach Boys,” a standout track on the record that compares favorably to anything 2019 has produced thus far. The record was recorded at Rose Raft, a small arts organization and studio in rural Southern Illinois. In fact, all of Glued’s catalog has been recorded here, along with Miranda Winter’s wonderful 2018 release Xobeci, What Grows Here?. It’s an interesting line of continuity through Glued’s work, made all the more interesting by the incongruity of the rural setting with their jagged and propulsive output. Whatever wizardry is at work, they should certainly continue the spell. I was intrigued after reading about Rose Raft and reached out to recording engineer Philip Lesicko about it. He recorded Cool Evil, as well as Glued’s prior releases. He provided some input on Cool Evil, working with Glued, and Rose Raft. BG: It looks like you've done at least a couple recordings with Glued. How did you meet them? PL: I met Sean a really long time ago at a show. I think he was 15 or around that age. He had an alien anxiety to him, something I find is a redeeming quality in all the people I really grow to love. He told me the band I was in at the time sounded “kinda like Pavement and Sonic Youth,” two of my favs back then. I didn’t see him again until a few years ago and we reconnected pretty instantly. I saw Glued play and I was really stoked on it. BG: Rose Raft seems like a really interesting and beautiful place to make a record. Did anything about the location add to the recording process with Glued? PL: I find being isolated while recording is really beneficial to making a record. No distractions. Rose Raft is in a tiny village with absolutely nothing to do but record and make art. The landscape is beautiful and peaceful. You can see our whole galaxy on a clear night. It creates a super positive environment for creating. If the session goes well and everyone is feeling it, there is a special bond that is created. It’s an intimacy that is unmatched. Especially mixing analog, you can feel the song. You can physically move everything into its place. It feels really real and I’m excited about how Cool Evil turned out. Rose Raft is an analog studio so it’s super important to get it right as you go. I really like making records that way, most artists I work with do as well. BG: Any fun/interesting anecdotes about the working on this record? We did the first few recordings of theirs super fast, recording and mixing everything in a few days. For Cool Evil, I had a different approach in mind. They had really developed as a band playing together and knew the songs. I wanted to isolate the drums in a specific way. I had everyone play at the same time, but only focused on recording Chelsi’s drum parts. So everyone was basically DI’ed, playing along to Chelsi. She killed that record, I was so excited and into the sounds we were getting. She is definitely my favorite drummer to record. She has such a rad style and energy and hits the drums in such a perfect way to make them sound huge. Once all the drum parts were tracked, I took everything else out and each member added their part. It was really fun to piece it all together. I always get the chills listening to certain vocal performances. It’s really rad to experience it as its coming from the other room, right into the speakers. “Fish Song” is one of those performances. I still get the chills every time I hear it.